Keith Christie was born in Blackpool in 1931. 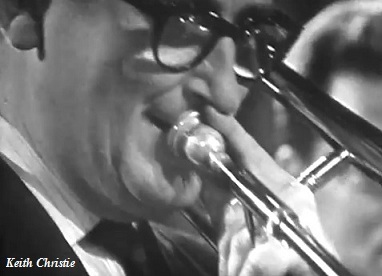 He was a a talented trombone player who started out as a traditionalist with Humphrey Lyttelton in the early 1950s and quickly moved on to form the Christie Brothers Stompers with his brother Ian on clarinet. 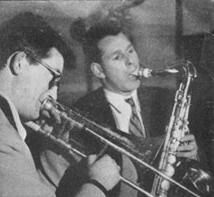 His musical style changed and in 1953 he joined Johnny Dankworth's modern big band where he stayed until 1955. Periods with Tommy Whittle and freelancing on the London club scene followed until in 1957 he joined Ted Heath's big band where he remained for eleven years or so until 1968, returning in 1977 for concert work. After Heath he went into studio work and part time was a regular member of the Tubby Hayes big band. In the early 1970s he toured Europe with Benny Goodman and continued to work in a wide based series of musical activity including the big band of Kenny Wheeler. By the late 1970s Christie was playing in the London production of the jazz based show Bubbling Brown Sugar. He suffered a serious accident one night when he fell off the raised stage set and after a long recovery period returned to playing, including concerts with the Best of British Jazz Package. He had been an alcoholic for a number of years and died in 1980 at the early age of 49. His vigorous robust sound was a delight to hear although he made few modern jazz records under his own name. Norman Atkinson writes that "Keith was one of my clerks in Tech Wing Library at RAF Hendon in 1950, he was part of the RAF Station Band and was also a member of the Hendonaires which was the station dance band". 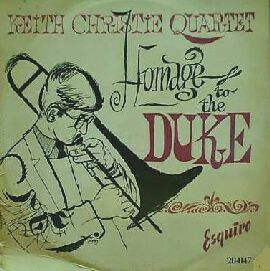 The earliest recordings that Keith Christie made were with the traditional jazz band of Humphrey Lyttelton. The band undertook five recording sessions in 1949 for the Esquire label before switching to Parlophone. Christie's last recording was a live Royal Festival Hall concert on July 14th, 1951 after which he left the band and was replaced by alto sax player Ade Monsbourgh. Keth Christie took part in three sessions for the Melodisc label. This band, included cornet player Dickie Hawdon who later dramatically switched styles to the modern school, playing in a quintet with Tubby Hayes and then soloist with the Johnny Dankworth Orchestra. Christie himself also changed to become a modernist. Jimmy Deuchar (tp), Keith Christie (tb), Vic Ash (cl), Ronnie Scott (ts), Johnny Dankworth (as), Victor Feldman (vib), Ralph Sharon (p), Ivor Mairants (g), Joe Muddel (b), Jack Parnell (d). Leap Year (2 takes one take on*)/Up The Poll (2 takes one take on^)/M.M.Special (Part 1)/M.M.Special (Part 2). Derek Abbott, Eddie Blair, Bill Metcalf, George Boocock (tp), Maurice Pratt, Keith Christie, Eddie Harvey, Gib Wallace (tb), Johnny Dankworth, Lew Smith, Maurice Owen (as), Rex Morris, Freddy Courteney (ts), Alex Leslie (bs), Bill Le Sage (p), Eric Dawson (b), Allan Ganley (d). The Slider*/Talk Of The Town*#. Personnel as November 12th exceptGeoff Cole (as) replaces Lew Smith. My Buddy*/Runnin' Wild*#/The Jerky Thing. Jo Hunter, Jimmy Deuchar (tp), Keith Christie (tb), Jimmy Skidmore, Don Rendell (ts), Ralph Dollimore (p), Johnny Hawksworth (b), Allan Ganley (d). Jo Hunter, Jimmy Deuchar (tp), Keith Christie (tb), Jimmy Skidmore, Don Rendell (ts), Derek Smith (p), Johnny Hawksworth (b), Phil Seamen (d). Keith Christie (tb), Don Rendell (ts), Derek Smith (p), Sammy Stokes (b), Phil Seamen (d). Keith Christie (tb), Jimmy Skidmore (ts), Dill Jones (p), Jack Fallon (b), Allan Ganley (d). Dickie Hawdon (tp), Keith Christie (tb), Bruce Turner (as), Jimmy Skidmore (ts), Dill Jones (p), Jack Fallon (b), Allan Ganley (d). I Can't Give You Anything But Love/Going To Minton's/I'm Beginning To See the Light. Derek Abbott, Eddie Blair, Bill Metcalf, George Boocock (tp), Maurice Pratt, Keith Christie, Eddie Harvey, Bill Geldard (tb), Johnny Dankworth, Geoff Cole, Maurice Owen (as), Rex Morris, Freddy Courteney (ts), Alex Leslie (bs), Bill Le Sage (p), Eric Dawson (b), Allan Ganley (d), Cleo Laine (vcl). Ain't Misbehavin'*#/I Got Rhythm*#/I Know You're Mine(vcl CL)*#/I Got It Bad And That Ain't Good*#. Derek Abbott, Bill Metcalf, Eddie Blair, George Boocock (tp), Maurice Pratt, Keith Christie, Eddie Harvey, Bill Geldard (tb), Johnny Dankworth, Geoff Cole, Maurice Owen (as), Tommy Whittle, Rex Morris (ts), Alex Leslie (bs), Derek Smith (p), Jack Seymour (b), Allan Ganley (d), Frank Holder, Tony Mansell, Cleo Laine (vcl). Bugle Call Rag*^/Four Of A Kind*#/Perdido*^#/You Go To My Head*#. Hold My Hand (vcl TM)/The High And Mighty (vcl TM). Mambo In Moonlight (vcl FH)/Stop! Proceed With Caution . Derek Abbott, Bill Metcalf, Douggie Roberts, Jimmy Venn (tp), Maurice Pratt, Keith Christie, Bill Geldard, Danny Elwood (tb), Johnny Dankworth, Maurice Owen, Dougie Robinson (as), Rex Morris, Don Pashley (ts), Alex Leslie (bs), Derek Smith (p), Bill Sutcliffe (b), Allan Ganley (d). Singin' In The Rain*/Waterloo Walk/Non-stop London*. Kenny Baker (tp), Keith Christie (tb), Bruce Turner (as), Jimmy Skidmore (ts), Harry Klein (bs), Dill Jones (p), Ike Isaacs (g), Frank Clarke (b), Benny Goodman (d). That's The Blues Dad/Blues In Threes*. Cleo Laine(vcl), Keith Christie (tb), Johnny Dankworth ("Dee") (cl,as), Bill Le Sage (vib,p), Bill Sutcliffe (b), Allan Ganley (d). It Was A Lover And His Lass*#^/Spread A Little Happiness*/You're Blase*/I'm On A See-saw*/You've Done Something To My Heart*^/Mad About The Boy*/It's A Pity To Say Goodnight*#/A Love Like Ours*. Gershwin Ballad Medley: (Summertime*/Someone To Watch Over Me*/Love Walked In*/Embraceable You*)/Waxing The Winners (Part 1)/Waxing The Winners (Part 2). Kenny Baker (tp), Keith Christie (tb), Jimmy Skidmore (ts), Harry Klein (bs), Dill Jones (p), Cedric West (g), Frank Clarke (b), Eric Delaney (d). On The Alamo*/What's New*/Making Whoopee*/How Long Has This Been Going On*/Sweet And Lovely*/I'm Beginning To See The Light*. Keith Christie (tb), Johnny Dankworth ("Dee") (as), Bill Sutcliffe (b), Allan Ganley (d). Sultry Serenade/Baby Please Stop/Cottontail#/Never No Lament/Mainstem*/I Got It Bad*/Drop Me Off at Harlem/It Don't Mean a Thing. Kenny Wheeler (tp), Keith Christie (tb, v-tb), Ronnie Baker (as), Tommy Whittle (ts), Joe Temperley (bs), Don Riddell (p), Freddie Logan (b), Eddie Taylor (d). Laura/Lester Leaps In/Jive At Five/How High The Moon. probable personnel: Kenny Baker, Tommy McQuater (or Freddy Clayton) (tp), Keith Christie, George Chisholm (tb), EO Pogson, Harry Hayes, Keith Bird (reeds), Derek Collins (ts) Harry Klein (bs), Derek Smith (p), Bill Le Sage (vib), Joe Muddel (b), Phil Seamen (d). Midriff*/Bugler's Lament*/The Blues I Love To Sing*/The Moon Is Low*/I Can't Escape From You*/Straight Life*/9.20 Special*/In A Sentimental Mood*/We'll Be Together Again*/Plymouth Rock*/Oh! You Beautiful Doll*/Woofti*/My Blue Heaven*/Not Really The Blues*/C'est Ci Bon*/Duke's Jam*. Kenny Baker (tp), Keith Christie (tb), Bruce Turner (as,cl), Jimmy Skidmore (ts), Fred Hartz (bs), Dill Jones (p), Ike Isaacs (g), Martin Slavin (vib,xyl), Jack Fallon (b), Phil Seamen (d). Time's A Wastin'*/Three Little Words/Blues For John*. Just One Of Those Things/Autumn In New York/Don't Get Scared/I Let A Song Go Out Of My Heart. A session featuring Ted Heath sidemen in various combinations plus a few jazz men. Main jazz musicians present included Don Rendell, Tommy Whittle (ts), Ronnie Ross (bs), and Keith Christie (tb). Keith Christie (tb, v-tb), Tommy Whittle (ts), Derek Smith (p), Arthur Watts (b), Eddie Taylor (d). Lullaby In Rhythm/Lullaby Of Birdland/Lullaby Of The Leaves/Lullaby Of Broadway. Keith Christie (tb), Tommy Whittle (ts), Dill Jones (p), Lennie Bush (b), Tommy Jones (d). Keith Christie (tb), Vic Ash (cl), Derek Smith (p), Sammy Stokes (b), Phil Seamen (d). Cinders/You Took Advantage Of Me/Ash Feld/With The Wind And The Rain In Your Hair*. Kenny Baker (tp,flhrn), Tommy McQuater (tp), Keith Christie (tb,v-tb), George Chisholm (tb), EO Pogson (bs sax,ocarina), Harry Hayes (as), Keith Bird (cl,ts), Derek Collins (cl) Harry Klein (bs), Derek Smith (p), Bill Le Sage (vib,acc), Lennie Bush (b), Phil Seamen (d). John's Idea*/Someone To Watch Over Me*/It's Only A Paper Moon*/Down In Our Alley Blues*/Would You Like To Take A Walk*/You're Lucky To Me*/Sister Kate*/Kansas City Kitty*/Cherry Point*/Love For Sale*/Alice Blue Gown*/Ill Wind*/Swinging On C*. Kenny Baker, Eddie Blair, Bert Courtley (tp), George Chisholm, Keith Christie, Don Lusher (tb), Joe Harriott (as), Don Rendell, Jimmy Skidmore (ts), Harry Klein (bs), Bill Le Sage (vib), Dave Lee (p), Johnny Hawksworth (b), Allan Ganley (d). Christie made a temporary return to the traditional jazz ranks for this Parlophone EP. Again the band, included trumpet player Dickie Hawdon who at this time was playing with the modernists. 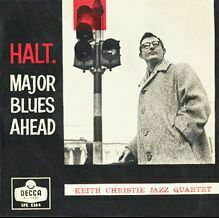 Keith Christie (tb), Eddie Harvey (p), Pete Blannin (b), Eddie Taylor (d). Gone With The Wind/The Lantern Man/Halt, Major Blues Ahead. Humphrey Lyttelton, Eddie Blair, Bert Courtley, Bobby Pratt (tp), John Picard, Eddie Harvey, Keith Christie (tb), Tony Coe (as,cl), Ronnie Ross (as), Jimmy Skidmore, Kathy Stobart (ts), Joe Temperley (bs), Ian Armit (p), Brian Brocklehurst (b), Eddie Taylor (d). Swingtime In The Rockies*/I Can't Get Started*/For Dancers Only*/Alligator Crawl*. Bert Courtley (tp), Keith Christie (tb), Vic Ash (cl,ts), Dill Jones (p), Bill Sutcliffe (b), Benny Goodman (d). Struttin' With Some Barbecue/Gone Tomorrow/The Preacher/Farewell Blues/Them There Eyes/Caravan/St. David/Jones The Jazz/I Can't Give You Anything But Love, Baby. Jimmy Deuchar, Ian Hamer, Les Condon (tp), Keith Christie (tb), Ken Wray (v-tb), Ronnie Ross (as,bs), Tubby Hayes (ts,f,vib), Ronnie Scott (ts), Stan Tracey (p), Kenny Napper (b), Bobby Orr (d). Heather Mist*/Sumphin'*/Stablemates*/First Eleven*/Stella By Starlight*. font color="#000000">Tubby Hayes (ts, fl), Victor Feldman (p), Jeff Clyne (b), Bill Eyden (d). Tubby Hayes (ts,vib), with: Bobby Pratt, Eddie Blair, Jimmy Deuchar (tp), Keith Christie (tb), Ken Wray (v-tb), Johnny Scott, Bob Efford, Vic Ash, Harry Klein (reeds), Alan Civil (frh), David Snell (harp), Gordon Beck (p), Freddy Logan (b), Allan Ganley (d). Take Your Partners For The Blues/Peace/Souriya/Down In The Village/Early Morning Afterthoughts. Jimmy Deuchar (tp,mell), Les Condon (tp), Keith Christie (tb), Tubby Hayes (ts,vib,as), Paul Gonsalves (ts), Jackie Sharpe (bs), Stan Tracey (p), Lennie Bush (b), Ronnie Stephenson (d). Tupa*/Mini Minor*/Souriya*/Baby Blue*/Amber Mood*/Just Friends*/Pedro's Walk*. Eddie Blair (tp,fl-hrn), Kenny Wheeler (tp,t-hrn), Keith Christie (tb), Alf Rees (tu), Roy Willox (as,f), Tubby Hayes (ts,f,vib), Ronnie Ross (bs,b-cl), Dave Lee (p), Spike Heatley (b), Kenny Clare, Ronnie Stephenson (d). Manners Maketh Man/Let's Find An Island/Our Kind Of People/Yesterday's World/Little Darling/I Tried/I Never Looked For You/Oh! For A Husband/My Time Will Come/Were I As Good (Tommy Whittle replaces Hayes on this title only). Kenny Baker, Eddie Blair, Ian Hamer, Les Condon (tp), Keith Christie, Wally Smith, Chris Smith (tb), Ronnie Baker (as,cl), Alan Branscombe (as), Ronnie Scott, Bobby Wellins (ts), Harry Klein (bs), Stan Tracey (p,arr), Jeff Clyne (b), Ronnie Stephenson (d). Afro-Charlie Meets The White Rabbit*/Portrait Of A Queen*/Alice In Jazzland*/Fantasies In Bloom*/Teatime Gavotte*. Murdering The Time*/Summer Hallucinations* (no tp,tb)/Pig And Pepper* (Ronnie Scott, Stan Tracey, Jeff Clyne, Ronnie Stephenson only). Kenny Baker, Ian Hamer, Greg Bowen, Les Condon, Kenny Wheeler (tp), Keith Christie, Nat Peck, Johnny Marshall, Chris Smith (tb), Roy Willox, Ray Warleigh (as,fl), Ronnie Scott (ts,fl), Tubby Hayes (ts,fl,vib), Bob Efford (ts,oboe,fl,b-cl), Ronnie Ross (bs,b-cl), Gordon Beck (p), Jeff Clyne (b), Ronnie Stephenson (d). Night In Tunisia*/Milestones*/Sonnymoon For Two*/Bluesology*. Personnel as May 10th, 1966 except Harry Klein (bs) and Johnny Butts (d) replace Ronnie Ross and Ronnie Stephenson. Kenny Baker, Eddie Blair, Stan Roderick, Kenny Wheeler (tp), Keith Christie, Don Lusher, Johnny Marshall (tb), Jackie Armstrong (b-tb), Douggie Robinson, Roy Willox (as), Tony Coe, Tubby Hayes (ts), Don Honeywell (bs), Alan Branscombe (p), Freddy Logan (b), Kenny Clare, Ronnie Stephenson (d). The Hawk Talks*/Topsy*/Dual Carriageway*/Afro Charlie*. Greg Bowen, Bert Ezzard, Ian Hamer, Kenny Wheeler (tp), Keith Christie, John Edwards, Nat Peck (tb), Douggie Robinson, Ray Warleigh (as), Tony Coe, Tubby Hayes (ts), Don Honeywell (bs), Alan Branscombe (p), Lennie Bush (b), Kenny Clare, Ronnie Stephenson (d). Drum Boogie*/Just You, Just Me*/Big Noise From Winnetka*/South Rampart Street Parade*. Ian Hamer (tp,fl-horn), Keith Christie (tb), Tubby Hayes (ts), probably Harry South (p), probably Kenny Napper (b), probably Bill Eyden (d). Freakin' Out*/Conversations At Dawn*/Corpus*/Cambridge Crescent*/Tobago*. Kenny Baker, Derek Watkins, Eddie Blair, Les Condon (tp), Keith Christie, Maurice Pratt, Bobby Lamb (tb), Alan Branscombe (vib,mar), Stan Tracey (p,arr,cond), Dave Green (b), Barry Morgan (d,perc), Denis Lopez, Stuart Gordon (perc). What Else Can You Do With A Drum?/Capullito De Aleli/One For Bo-Bo. Derek Watkins, Paul Tongay, Kenny Baker, Eddie Blair, Les Condon (tp), Ian Carr (flh-1), Keith Christie, Don Lusher, Chris Pyne, Bobby Lamb, Chris Smith (tb), Acker Bilk (cl-2), Joe Harriott (as-3), Don Rendell (sop-4,ts-5), Tony Coe (ts-6), Stan Tracey (p,arr,cond), Lennie Bush (b), Barry Morgan (d). Blue Feeling-1,2,3,5,6 /I Let A Song Go Out Of My Heart/Passion Flower-4 /Lay-By-1,2,3,5,6 /I'm Beginning To See The Light-1 /In A Sentimental Mood-3 /Creole Love Call-2 /We Love You Madly. Greg Bowen, Ian Hamer, Les Condon, Kenny Wheeler (tp), Keith Christie, David Horler, Bill Geldard (tb), Peter King (as), Tubby Hayes, Brian Smith (ts), Harry Klein (bs), Louis Stewart (g), Ron Mathewson (b), Spike Wells (d). Song For A Sad Lady*/Dear Johnny B*/March Brown*/Rumpus*/You Know I Care*/Seven Steps To Heaven*/The Inner Splurge*. Ian Hamer, Kenny Wheeler, Greg Bowen, Hank Shaw (tp), Keith Christie, David Horler, Bill Geldard (tb), Peter King (as), Tubby Hayes, Brian Smith, Alan Skidmore (ts), Harry Klein (bs), Mike Pyne (p), Louis Stewart (g), Ron Mathewson (b), Spike Wells (d). A Song For A Sad Lady*/You Know I Care*. Derek Watkins, Tony Fisher, Greg Bowen, Hank Shaw (tp), Keith Christie, Chris Pyne, Mike Gibbs (tb), Peter King, Dennis Walton (as), Tony Coe (ts,cl), Alan Skidmore (ts), Ronnie Ross (bs), Frank Ricotti (vib,cl), Stan Tracey (p,arr,cond), Dave Green (b), Bryan Spring (d). All The World's A Stage/Overture And Beginners/Matinee Days/Enter Romeo/Principal Centre Stage/Wisdom In The Wings/Panto Panta/Kindly Leave The Stage. Leon Calvert, Kenny Wheeler (tp), Keith Christie (tb), unknown (flhr) (tu), Duncan Lamont (as), Tony Coe (ts), Ronnie Ross (bs), Pat Smythe (p), Daryl Runswick (b), Kenny Clare (d), John Lanchberry (cond), Richard Rodney Bennett (arr). Gerry Salisbury (cnt), Ray Crane (tp), Keith Christie, John Picard (tb), Sandy Brown (cl), Tommy Whittle (ts), Brian Lemon (p), Lennie Bush (b), Phil Seamen (d). Allen's Alley (GS,RC,SB out)/It's A Wonderful World/When Sonny Gets Blue (GS,RC,KC,JP out)/Just Squeeze Me. Ian Hamer (tp,fl-horn), Keith Christie (tb), Tubby Hayes (ts,fl), Alan Branscombe (p), Daryl Runswick (b), Spike Wells (d). Greg Bowen, Paul Tungay, Ronnie Hughes, John McLeavy (tp), Bobby Lamb, Jimmy Wilson, Keith Christie, Bill Geldard (tb), Bob Burns (as,cl,ts), Alfie Reece (tu), Bill McGuffie (p), Alan Metcalfe (g), Frank Donnison (b), Bobby Midgley (d). The Odd Couple*/Alan's Dell*/I'm Old Fashioned*/Fly Me To The Moon*/Emily*/Indiana*/Lester Leaps In*/It Zoots Zim*/Between You And Me*/Beautiful Friendship*/Idaho*/Old McDonald Had A Farm*. Personnel includes: Kenny Wheeler (flhrn,tp), Ian Hamer, Dave Hancock, Greg Bowen (tp), Keith Christie, David Horler, Bobby Lamb, Chris Pyne (tb), Jim Wilson, Malcolm Griffiths (b-tb), Alfie Reece (tu), Mike Osborne (as), Duncan Lamont (ts,f), Evan Parker (ts,sop), Alan Branscombe (p,el-p), John Taylor (el-p), Derek Bailey (g), Ron Mathewson (b), Tony Oxley (perc), Norma Winstone (vcl - 1). Toot-toot*/Ballad For Two(1)*/Song For Someone(1)*/Causes And Events*/The Good Doctor*/Nothing Changes(1)*. Ian Hamer (tp,fl-horn), Keith Christie (tb), Tubby Hayes (ts,fl), Alan Branscombe (p), Ron Mathewson (b), Spike Wells (d). Ian Hamer (tp), Keith Christie (tb), Alan Skidmore (ts), Alan Branscombe (p), Ron Mathewson (b), Spike Wells (d). This Is For Albert*/Daffodils Are Yellow*/Greenwell's Glory*/Mini Minor*.